I had to stop today at one of our local megamalls to deal with a defective zipper on a winter boot I had bought there almost a month ago. Saturday is a day I tend to avoid malls at the best of times, but usually, “in the bleak mid-winter”, it can be tolerable. Maybe usually, but not today. Today, it was like the week before Christmas in that mall. The crowds of people were shoulder-to-shoulder. It left me asking myself, What recession? I’m no economist, but maybe it will be people’s willingness to spend beyond their means that may help bring the economy out of recession. But in the long term, what good will be done by the amassing of all that debt? Lots of questions I can’t answer, but when I look at the shopping malls, one thing I can say is that people are still spending. One thing I have in common with every church leader who is keen to see the church blossom and flourish is a desire to reach and retain folks who come to worship as guests. Recently, I found the book Fusion: Turning First-Time Guests Into Fully-Engaged Members of Your Churchand devoured it. It’s not a hard read, not a long read, but is a very practical and useful read. It’s written by Nelson Searcy (with Jennifer Dykes Henson). Searcy is a church planter, and pastor of a congregation in New York City that has several sites for its services. He has come up with an assimilation method that has proven itself to work. Seeing it on paper, I can see how it would work. Basically, the idea is to communicate with guests – and regulars – and encourage them to take small but important steps toward commitment to Christ and the local church. This happens through the use of cards inserted in every Sunday bulletin, incentives to encourage guests to fill them out (as they watch regular attenders fill them out, likewise), follow-up emails and letters, and simple encouragements to get guests to give serious consideration to making your church family their church family. Searcy’s method is simple and easy to follow. My one criticism of the book comes from what it assumes is happening: that is, he assumes that people are coming to faith in Christ through the worship gatherings, or through friends, and that they have likely already made a personal decision to follow Jesus by the time they get to a membership class. This is not always the case, of course, and he allows for this with an opportunity to lead people to Christ through the membership class. His theology of church membership is more traditional than biblical, in the sense that church membership as we typically see it is not readily found in Scripture. However, he points out that membership serves as a means of accountability, something that all growing followers of Christ need if they are to keep growing. One of Searcy’s greatest points is that people who have come for a few weeks in a row need to be offered a serving opportunity of some sort – greeting, ushering, preparing refreshments, playing in the band, etc. – because they will start to take responsibility for the church as ‘their’ church if they have a serving ministry. I hadn’t thought seriously about this before, but he’s absolutely right. As a teen, I was assimilated this way. I’ve seen many people assimilated under my own ministry – no thanks to me – through the initiative of another who thought to offer newcomers a serving role. I highly recommend this book, and intend to put it to use this week in my own ministry. 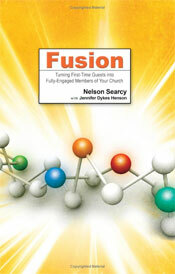 Fusion: Turning First-Time Guests Into Fully-Engaged Members of Your Church was published by Regal Books in 2007. ISBN-13: 978-0-8307-4531-9; ISBN-10: 0-8307-4531-9. You can check the author out on the web at www.ChurchLeaderInsights.com/Fusion.